Working with Alliance Architects was like working with long-time friends. They offered up to date designs appropriate for our business and were extremely honest about things that would work and would not work. I completely trust and value their input and would recommend their services without hesitation. The challenge was not only to raise the money but design and build a modern "client choice" pantry to serve this "food desert" community and to find someone to design and lead the construction. Not only did Alliance Architects step up, they designed a state of the art facility that is now serving hundreds of families who are no longer going to bed hungry. And they did it all "pro bono". Alliance is a very service-oriented company, and Carlos and Barb were always responsive in a timely manner. While creativity is abundant with this team, they also listened to our preferences and effectively tailored a design to meet our specific needs. We are extremely satisfied with Chamberlin’s newest office space and look forward to enjoying it for years to come. We would highly recommend Alliance Architects to anyone looking for a great design, solid architecture, and an excellent project. 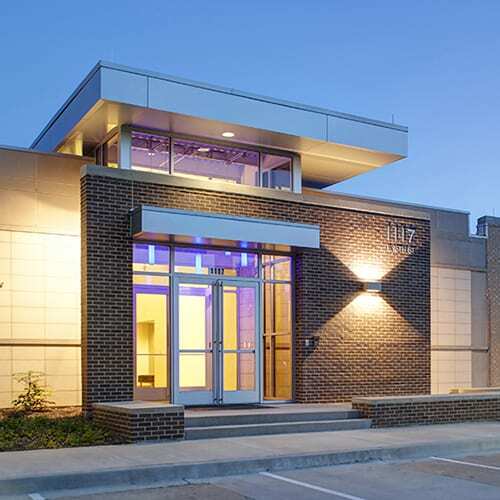 Trammell Crow has been partnering with Alliance Architects on industrial developments for over twenty years. Their willingness to go the extra mile to serve our team is invaluable to us and our Capital Partners. The Alliance team has the experience and dedication required to deliver the high-quality product we expect and to support our team throughout the entire development process. It is a pleasure to have worked with Alliance Architects for the past 10 years and appreciate their problem solving approach, quick responsiveness, attention to detail, and the unique and efficient building design. Charlie has assembled a team of true professionals who are highly respected in the community. They have a ‘can do’ attitude and consistently deliver projects on time, while providing innovative and creative thinking. Alliance Architects not only provides great design precision once a project is moving forward, but is also side-by-side with the developer on the leading edge of chasing deals down. They have been a tremendous partner for Seefried Properties in this regard. Their willingness to go the extra mile to serve their clients is invaluable to the success of our efforts to pursue and execute on development projects. We have leaned on their expertise, creativity and speed to help the Seefried team provide the highest level of excellence to our tenants throughout an often complex and competitive development process. Alliance Architects Inc. is a highly respected firm in the education sector. Their professionalism goes much more than skin deep; it’s a part of their culture. It is all about customer relationships with their team. I am constantly impressed with their ability to keep projects on track and maintaining the pace, to coordinating the weekly meetings, etc. They are responsive, highly qualified, and competent. They address challenges and requirements in a timely manner. Their focus is to reach solutions that meet both the District’s and User’s goals. They provide solutions that fit the District’s quality expectations, schedule, and budget, while still providing them with the best possible long term facility. In the 6 years I have had the pleasure of working with Chad and the Alliance team, I have found them to be competent, dedicated and experienced professionals. They offer unrivaled talent, knowledge and experience, not to mention a huge comfort zone for their clients. They are sensitive to constraints of both budget and time, professional in the dealings with the project team members, and responsive to Digital Realty’s needs – all while providing excellent design.